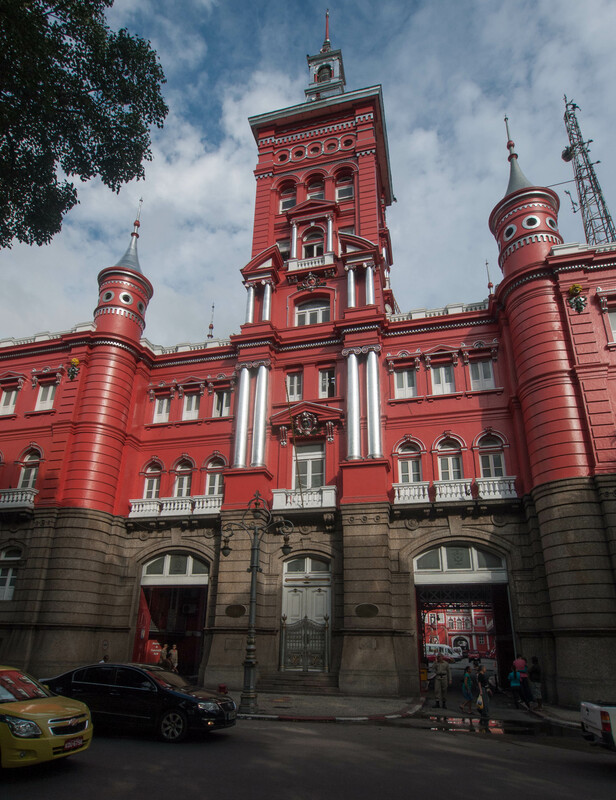 Our journey from Montevideo wasn’t the shortest route as we had to first fly across the Rio de Plata to Buenos Aires and from there we flew up to Rio. 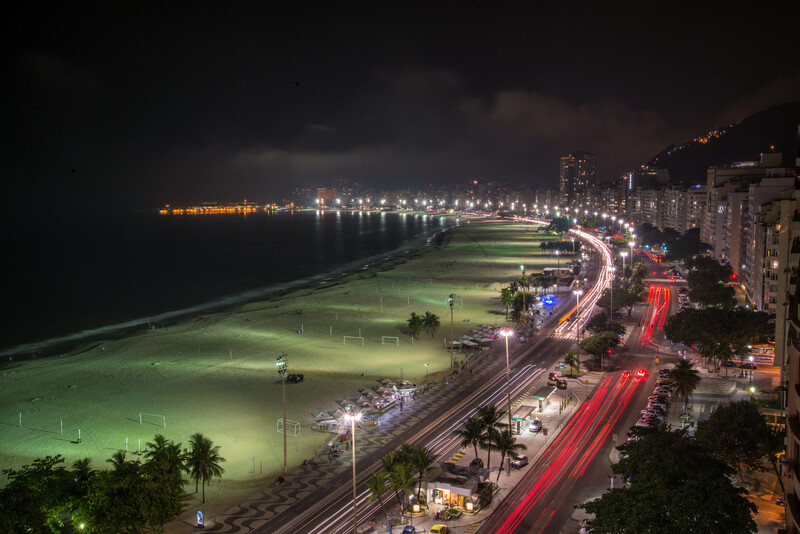 We arrived late in Rio at around 10pm so we jumped straight in a cab to our hotel. 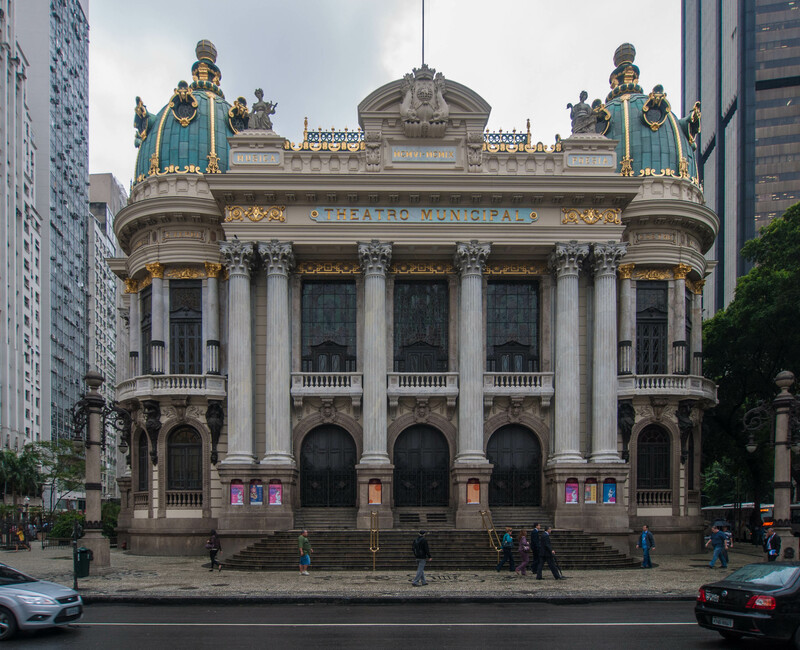 As this was the last stop on our journey before heading home we had booked a decent hotel right on Copacabana beach to go out with a bang. 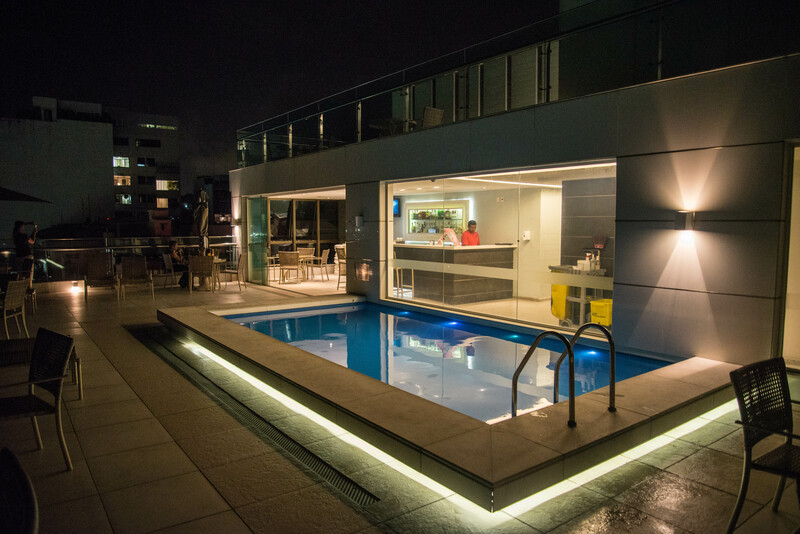 Hotels in Rio are ridiculously expensive, even hostels are charging over 100 USD per night but we ponied up for a last treat. When we visited Copacabana in Bolivia we had sung the Barry Manilow song to ourselves even though that time it was misplaced. 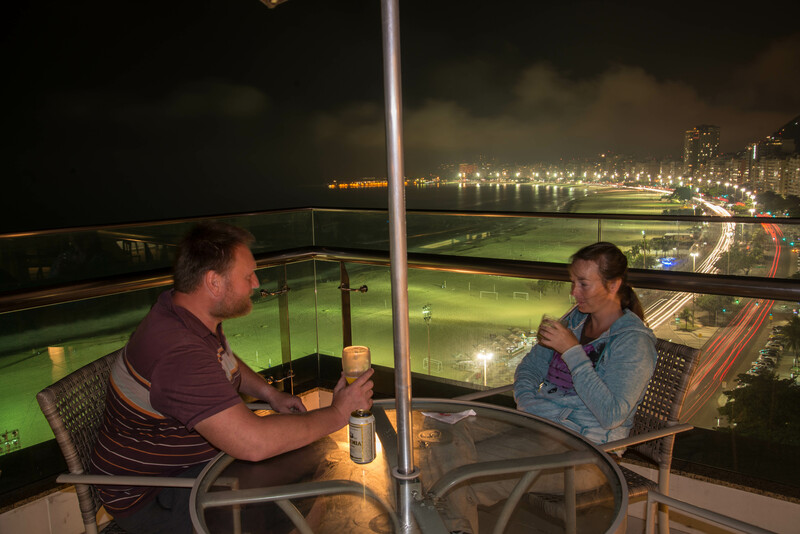 Now it was bang on the money and we couldn’t help humming to ourselves as we had a late night beer on the rooftop bar of our hotel looking out over the amazingly lit up beach. We only had 4 nights in Rio and 3 full days to do as much exploring as possible. This meant that we had to plan our time to maximise what we would see and do. Our first full day was a Sunday and that meant that it was time to explore the beaches. 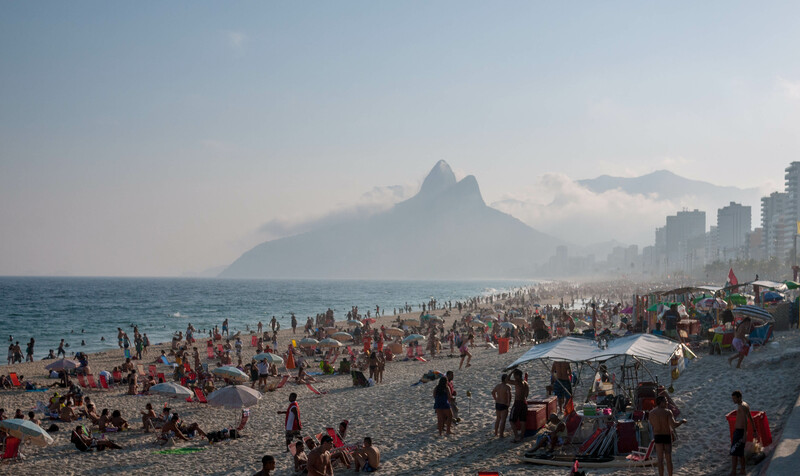 At the weekend the Rio natives all hit the beaches and they are absolutely packed. This is Rio as you imagine it. There was a whole load of sport going on, all zoned in different areas. 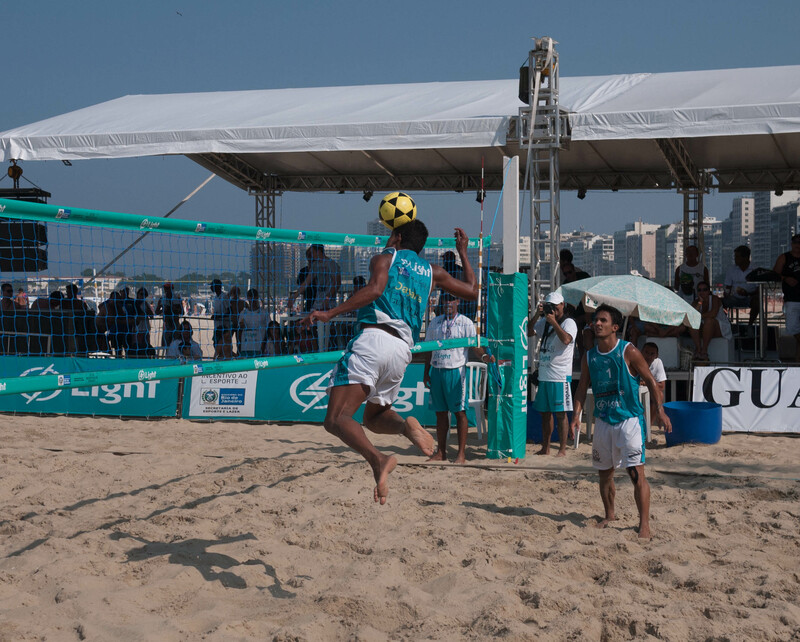 We saw football, volleyball and footvolley (volleyball played by kicking and heading the ball). 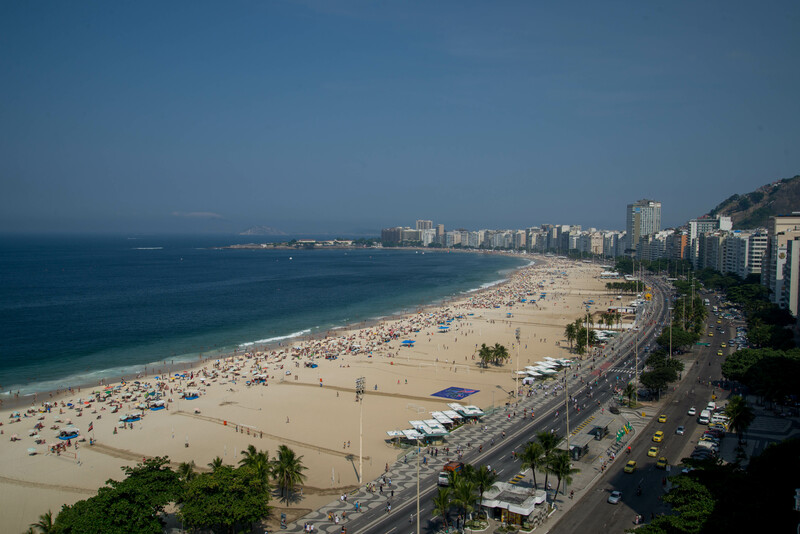 We walked the length of Copacabana and up into Ipanema and Leblon. 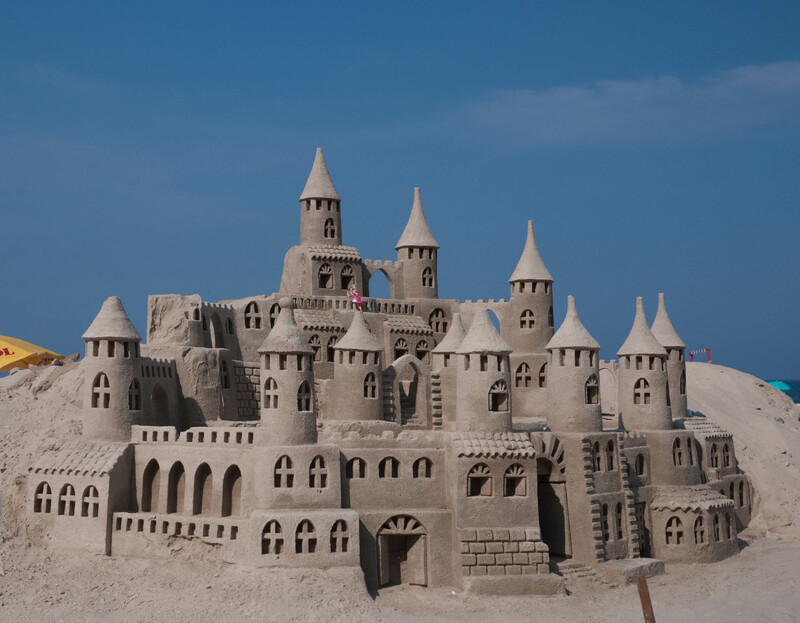 It’s a great environment with so much going on and plenty of beachside bars to refresh you on the way. Of course it helps that its hot and the sun is shining. 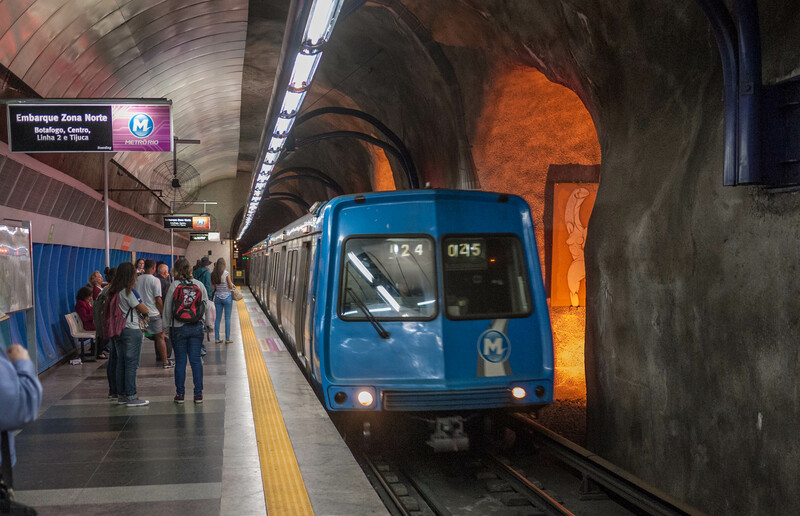 Day two of our Rio experience we caught the subway into the central business district. 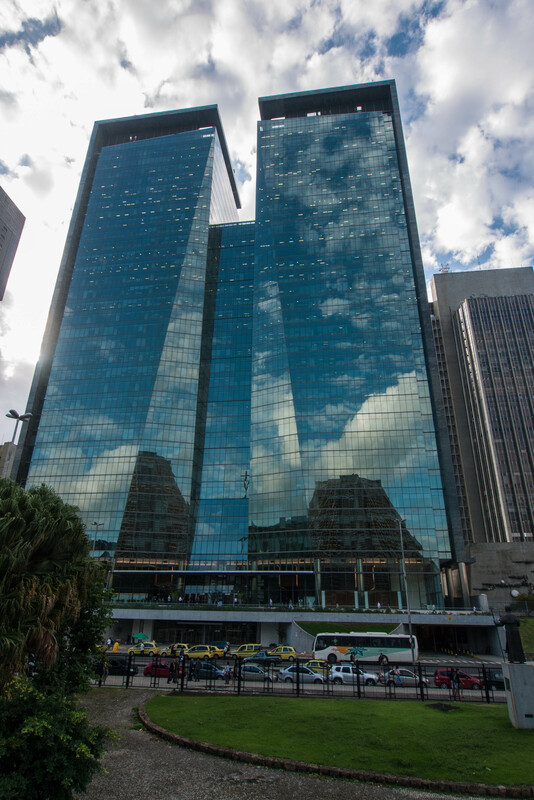 Rio is a big city and the central area is very similar to a European city. It is definitely very busy with lots of traffic and lots of people going about their daily lives. We enjoyed walking around checking out the many interesting buildings and having lunch in a city workers restaurant. After a full day walking around Rio we were knackered so really enjoyed going back to our lovely hotel room. For our third day in Rio we had booked a tour to get us out to some of the slightly more difficult to get to places (well we were being a bit lazy and without the Beast we had lapsed from traveller mode into tourist mode but we also wanted to fit in as much as possible into our limited time). We got picked up early in the morning and headed off, through the appalling traffic, down the beaches to Sao Conrado beach. This is where hang gliders land having leapt off the platform 520m up at Pedra Bonita. 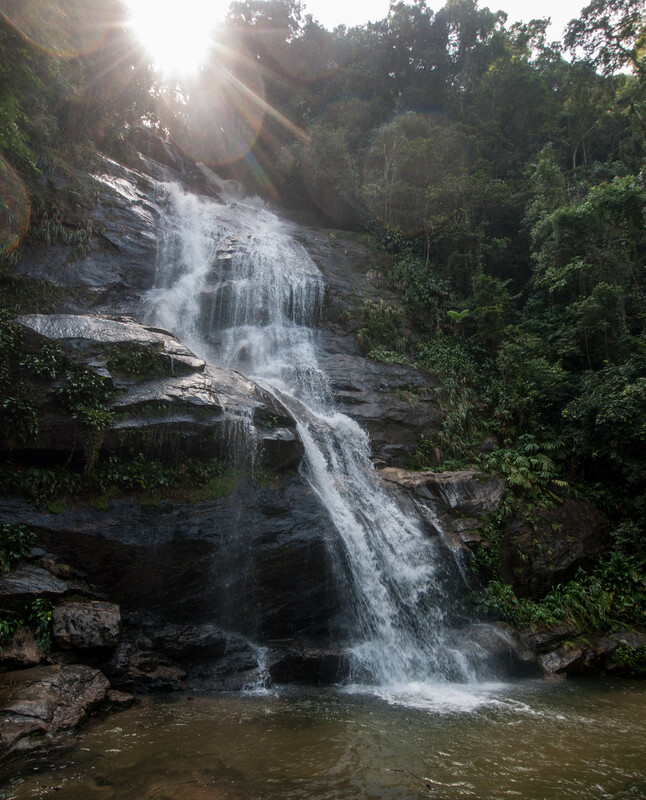 Our second stop was at the National Park of Tijuca Forest in the mountains above the city. As you drive up the winding roads the temperature noticeably drops and there is a cool freshness which is much appreciated. This has led to a number of exclusive neighbourhoods being in this area. In the forest we walked to a waterfall through the thick green woods. This would be a great place to spend a whole day cycling or hiking but on the tourist trail and with limited time it wasn’t long before we were herded back into the minibus and swept off on our whistle stop tour. 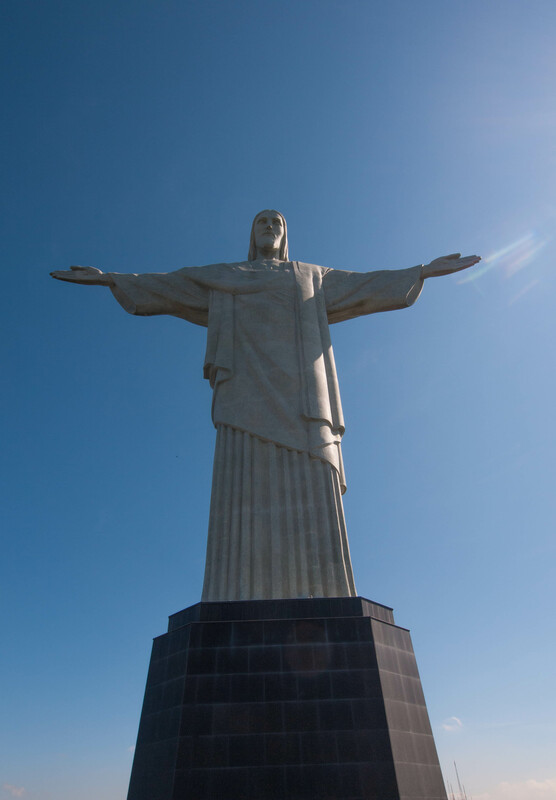 The highlight of the tour was the trip up to the top of Corcovado mountain (700m) where the 30m statue of Christ the Redeemer is situated. It is not possible to drive all the way to the top so we were transferred from one minibus onto another to take us to the small car park just below the base of the statue. From here it’s a short walk up some stairs (or a lift ride) to the viewing platform at the foot of the statue. The view of the city is fantastic (despite being hazy). The only downside is the hordes of tourists – mostly trying to get pictures of themselves with Christ The Redeemer in the same pose. 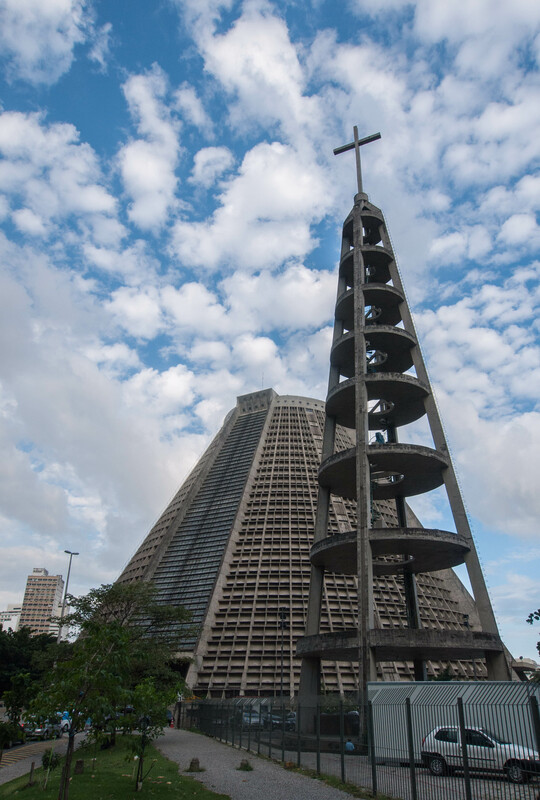 After coming down from the top of the Corcovado mountain our tour continued into the Lapa district which is just above the CBD. 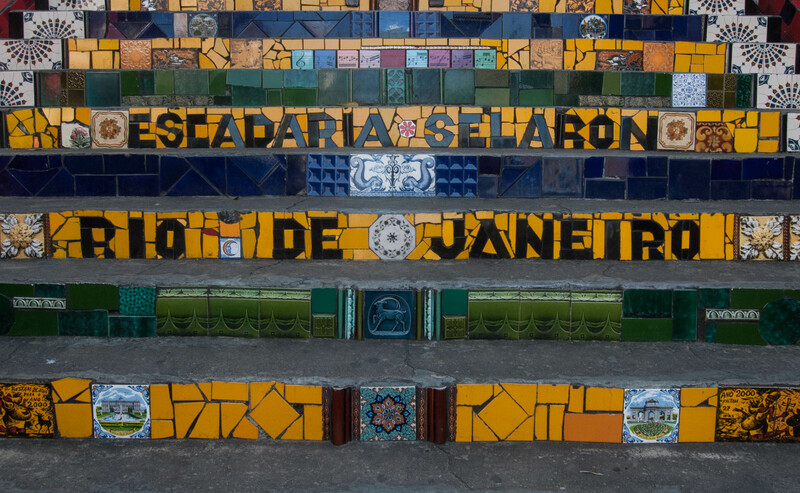 This is a bohemian neighbourhood (slightly dodgy in parts) with interesting café’s and art shops and famous for the Selaron stairs, otherwise known as the Lapa Steps. 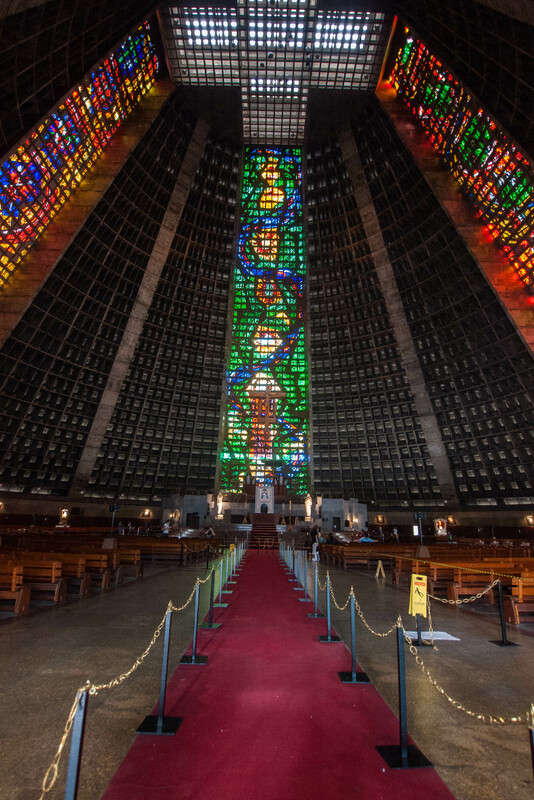 These were built by Jorge Selaron starting in 1990 and finally finishing at his death in 2013. 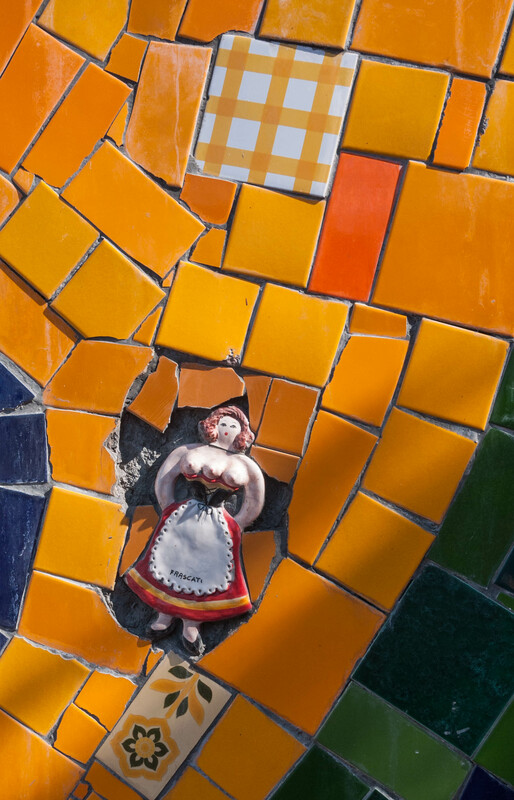 He covered the stairs in hand painted tiles many depicting a pregnant African woman whose identity he never revealed. After stopping for a late lunch in a local café at the base of the stairs our tour finished by dropping us off at the base of the Sugarloaf mountain which it is possible to ascend by way of a cable car to get stunning views of the city. 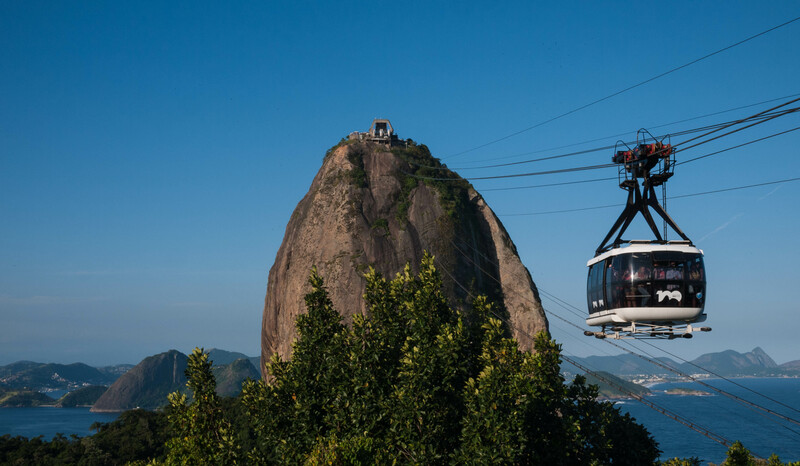 The cable car is in two sections; the first goes to the 220m high Morro da Urca and the second to Pao de Acuar which is 396m high. 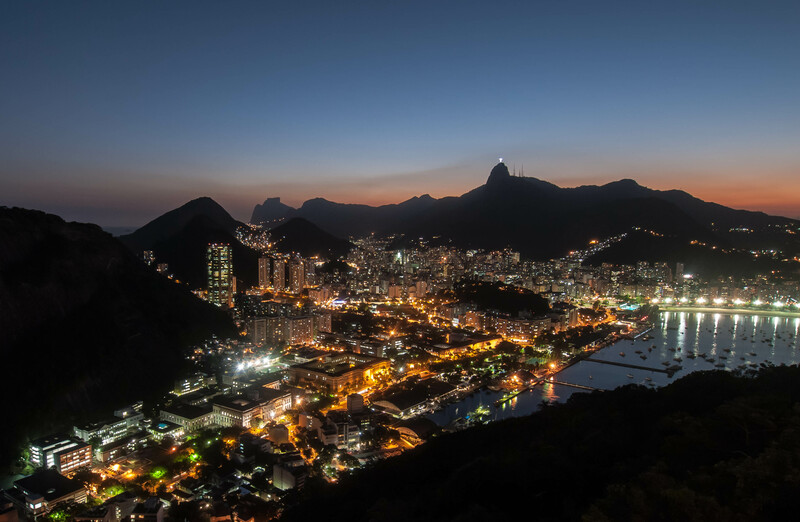 It was approaching sunset as we reached the top and we decided to stick around for the view but the Pao de Acuar became so crowded we went back down to the Morro da Urca for the sunset. 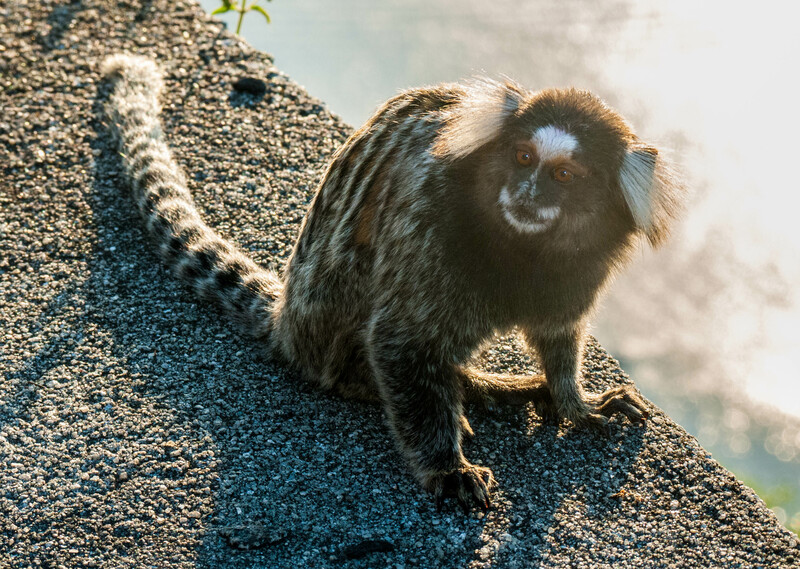 The other highlight was the many little marmosets that timidly appeared and just as quickly disappeared over the edge of the hilltop in an attempt to pick up any stray crumbs dropped by the masses. Our last day in Rio we booked a tour to visit one the favelas, Rocinha, which is the largest favela in Rio. 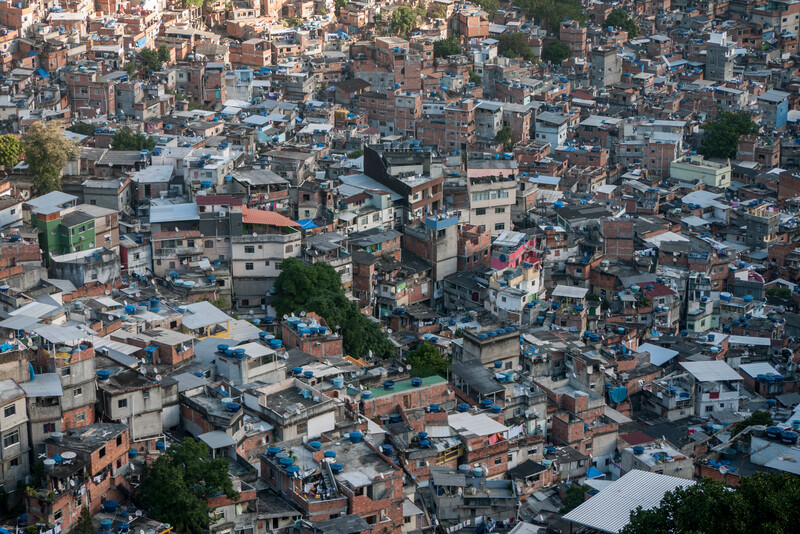 Favela is the Brasilian word for shanty town and this is how Rocinha started. These were originally lawless and run by drug cartels. 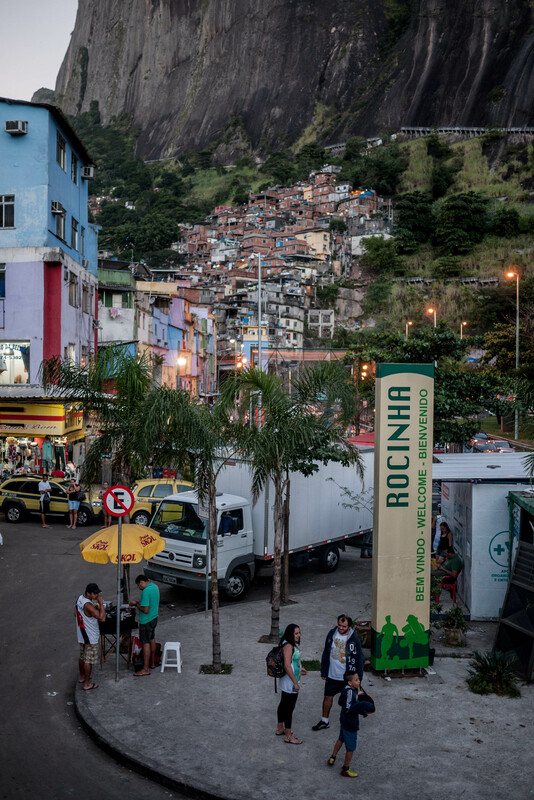 However the government has been pacifying the favelas one by one and investing money in them to bring in utilities and improve standards of living. Pacifying the favela means that the drug cartels have been run out and the police are now able to patrol inside. We started our tour at the top of the Favela to get some fantastic views of the township as it stretches down the mountainside. 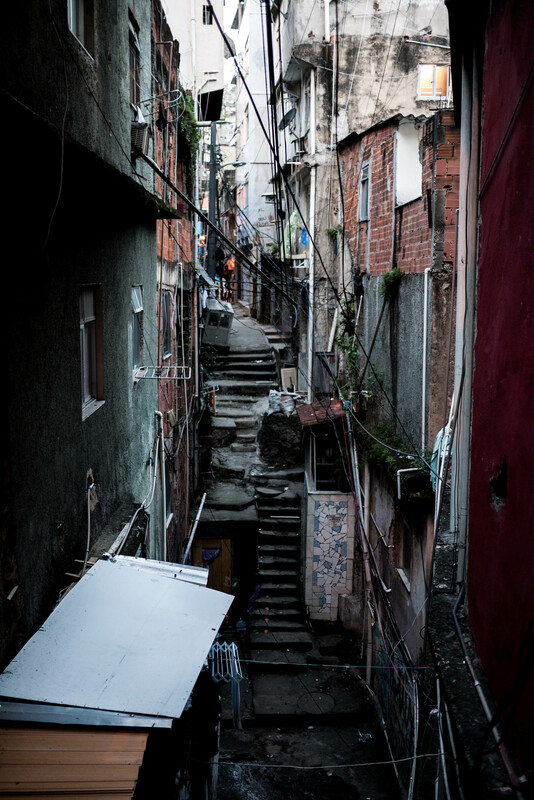 The tour involved walking down through tiny alleys through the Favela and down the mountainside. The alleys were a real maze however there is a main road that snakes its way through the Favela – mostly populated with motorbike taxis which seem the main way of getting around. 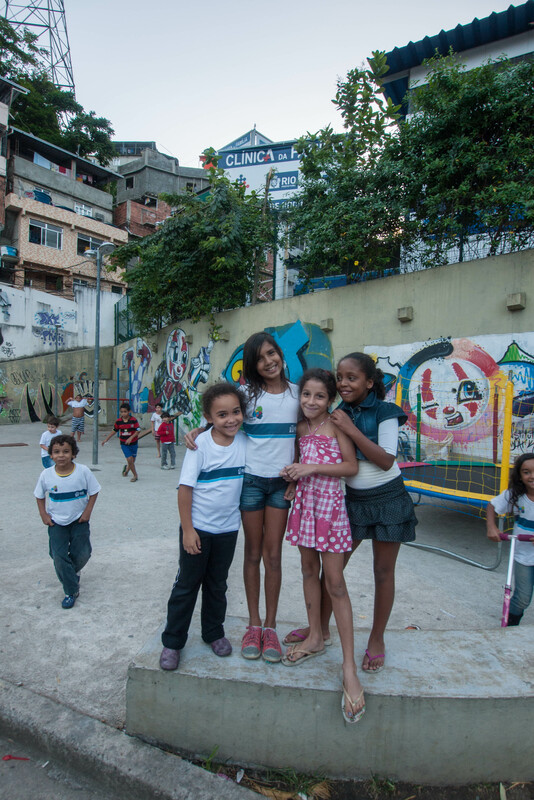 The thing that really struck us is that although the favela is not as nice as the rest of Rio, compared to the poorer countries in South and Central America the people living here are living quite well. We had seen far worse on our travels and were impressed by the government and the community’s drive to support, improve and development these neighbourhoods. 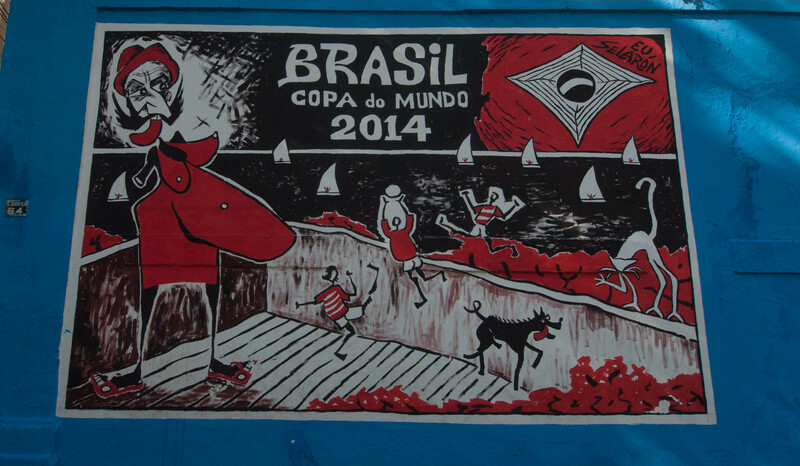 Having weaved our way down the hillside and reached the foot of the mountain the tour was over and we were dropped back at our hotel where we collected our bags and headed off to the airport – our time in Rio and indeed South America, was finally up. Well a big thank you for sharing your travels with the Beast through the Americas, what a shame we ,your readers ,won’t have any more to read, or will we ,are you already planning the next trip? Thanks again, great photos and an interesting commentary . We’d like to say thank you for your great and thorough blog, Mark and Sarah. My partner John and I are on our way to South America, currently in Guatemala. We got a good use of your tips, campsites and border crossings, and just enjoyed reading the posts and watching the photos.